PrixMax develops, manufactures and supplies OEM quality, long life and environmentally sustainable engine coolants, treatments and additives to the mining industry for all types of surface, subsurface and underground equipment. PrixMax offers a complete range of cooling system maintenance services, from site visits; fleet audits and staff training; to an advanced coolant laboratory testing and the analysis programme, Coolcheck®. PrixMax understands what it takes to operate under challenging conditions. For over 20 years, equipment managers at some of the world’s largest mining operations have trusted PrixMax coolants and maintenance solutions to protect their engines and prevent unscheduled downtime. PrixMax’s range of premium heavy-duty antifreeze coolants includes PrixMax MEG95 and PrixMax Heavy Duty N-ELC. PrixMax MEG95 is a universal heavy duty coolant recommended for all engines requiring a nitrite- and silicate-free coolant meeting ASTM D6210 and a wide variety of original equipment manufacturer (OEM) specifications. PrixMax Heavy Duty N-ELC is recommended for use in trucks, buses and heavy duty equipment requiring a nitrite-inhibited product, where ASTM D6210, Cat® EC-1 and TMC RP329 are cited. The advanced nitrited organic additive technology (NOAT) incorporates a nitrite and molybdate inhibitor package to deliver outstanding wet sleeve liner pitting and corrosion protection. PrixMax is an industry leader in the development and supply of next-generation, ultra long life glycol-free engine coolants and corrosion inhibitors for the mining industry. For mines operating in warmer climates, PrixMax’s glycol-free engine coolants are designed to provide superior heat transfer and cooling efficiency; super long life protection against corrosion, pitting and erosion for all system metals; and extended service protection for all OEM seals and elastomers. 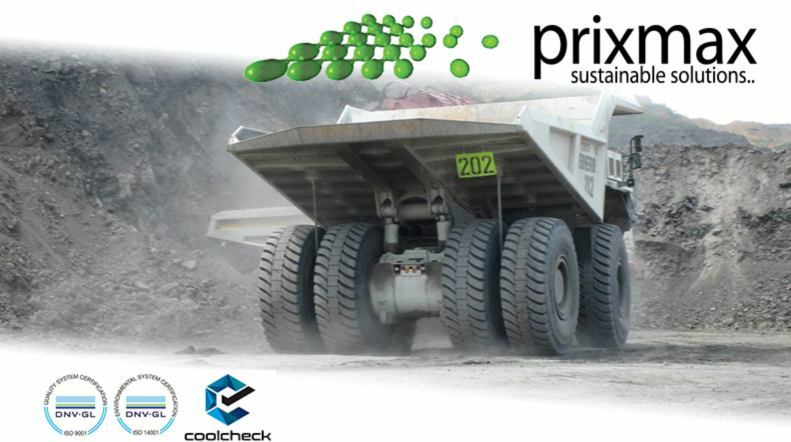 For underground mining applications in particular, PrixMax RCP coolants also eliminate the potential for fire hazards associated with combustible glycol-based antifreeze coolants. PrixMax RCP Platinum® is the latest in this line of coolant technology, incorporating an organic additive technology (OAT) heavy duty corrosion inhibitor package which can provide a service life of up to eight years or 1,250,000km of on-road use and eight years or 24,000 hours of off-road use. PrixMax RCP Platinum® and PrixMax RCP were the first coolants in the world to be certified Carbon Neutral. PrixMax’s heavy-duty coolants have been tested and proven to meet major OEM requirements and industry specifications. Both PrixMax MEG95 and Heavy Duty N-ELC have been formulated to meet ASTM D6210 – the international standard specification for glycol-based coolants for heavy-duty engines. Furthermore, PrixMax MEG95 meets or exceeds the specific requirements of numerous major OEMs, including Cummins®, DAF®, Detroit®, Hitachi®, Komatsu®, Liebherr®, MAN®, MTU® and Waukesha®. PrixMax RCP – which boasts arguably the most extensive field experience in Australia and Southeast Asia in mining applications of any comparable product on the market – has been tested to meet or exceed a broad range of OEM specifications for glycol-free coolants, including those set by Bergen Engines®, Detroit®, Jenbacher®, Liebherr®, MAN® and MTU®. Utilising coolant technology that has been tested and proven to meet major industry and OEM requirements, PrixMax’s heavy duty engine coolants can be inventoried with confidence across entire equipment fleets. PrixMax offers a full service preventative maintenance programme and product support through a dedicated technical support team, backed by PrixMax’s purpose built coolant testing and product development laboratories. The PrixMax Coolcheck coolant analysis programme is a unique and advanced preventative maintenance service that helps to extend equipment service life through accurate, regular level two testing of engine coolants. Coolant testing enables equipment maintenance managers to identify a range of potential issues with the system before they become serious enough to cause failure or shorten service life. For remote mining sites, PrixMax has developed tailored batching units and water treatment and filtration plants to allow for easy, cost-effective access to ready-mixed glycol-free engine coolants. PrixMax complements its heavy-duty coolant range with products that are designed to help extend the service life of equipment. The PrixMax additives and treatments range includes PrixMax radiator flush, radiator descaler, heavy duty supplemental coolant additives (SCAs), rim and tyre protectors, open system inhibitors, cooling system oil removers, diesel fuel treatments, re-manufactured engine cooling system conditioners, and other specialised corrosion inhibitors. With complete technical, laboratory, and research and development capabilities, PrixMax has the ability to offer tailored product solutions to suit any engine and any application. PrixMax is an industry-leading coolant manufacturer and supplier based in Australia. PrixMax was the first 100% Australian owned coolant company to introduce organic additive technology (OAT) coolants meeting key OEM specifications into the automotive, transport, oil & gas and mining industries in Australasia and Southeast Asia. PrixMax’s next-generation Rim and Tyre Protector (RTP) fluid treatment has been trusted by some of Australia and South-East Asia’s largest mining operators to protect and cool their off-road (OTR) rim and wheel assemblies. PrixMax is a market-leading developer, manufacturer and global supplier of engine coolants, heat transfer fluids and related products to the mining industry. We focus on developing high-quality coolants and related products that meet the extreme demands of heavy-duty engines operating across a wide variety of applications and industries. PrixMax has gained Mercedes-Benz formulation approvals for two of its most popular coolants, PrixMax MEG95 and PrixMax RCP, following completion of the Daimler testing and approval process. MTU Friedrichshafen (MTU) has recently approved PrixMax RCP for use in various commercial MTU series engines. Industry-leading engine coolant manufacturer PrixMax is proud to offer the first engine coolants in the world to be certified 100% Carbon Neutral. PrixMax is very excited to announce the launch of the new Coolcheck® web portal.